167 years ago today, Thursday, October 9, 1845, the Anglican priest Rev. 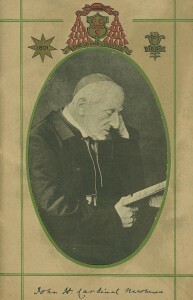 John Henry Newman was received into the Catholic Church by the Italian Passionist priest Rev. Dominic Barberi. Today, both Fr. Barberi and Fr. Newman are beati of the Catholic Church: Bl. Dominic of the Mother of God was beatified by Pope Paul VI during the second session of Vatican II, on October 27, 1963; Bl. John Henry Newman was beatified by Pope Benedict XVI on September 19, 2010. The influence of Cardinal Newman — one thinks he shall always be called that, no? — on the Catholic Church has been so profound that he has often been called “the Father of the Second Vatican Council”. Today is the third time since his beatification that Oct. 9th is Cardinal Newman’s feast day. It is not so in the General Roman Calendar, so most Catholics will celebrate Ss. Denis and companions, or St. John Leonardi, or no saint at all. But today is Cardinal Newman’s feast day in the particular calendars that have the celebration. O God, who bestowed on the Priest John Henry Newman the grace to follow your kindly light and find peace in your Church; graciously grant that, through his intercession and example, we may be led out of shadows and images into the fulness of your truth. Through our Lord Jesus Christ, your Son, who lives and reigns with you in the unity of the Holy Spirit, one God, for ever and ever. Amen. And in prospect of the Year of Faith, beginning two days from now, let us reflect upon Newman’s meditation “Hope in God — Creator”, which follows. 1. GOD has created all things for good; all things for their greatest good; everything for its own good. What is the good of one is not the good of another; what makes one man happy would make another unhappy. God has determined, unless I interfere with His plan, that I should reach that which will be my greatest happiness. He looks on me individually, He calls me by my name, He knows what I can do, what I can best be, what is my greatest happiness, and He means to give it me. Colloquy. O, my God, I will put myself without reserve into Thy hands. Wealth or woe, joy or sorrow, friends or bereavement, honour or humiliation, good report or ill report, comfort or discomfort, Thy presence or the hiding of Thy countenance, all is good if it comes from Thee. Thou art wisdom and Thou art love—what can I desire more? Thou hast led me in Thy counsel, and with glory hast Thou received me. What have I in heaven, and apart from Thee what want I upon earth? My flesh and my heart faileth: but God is the God of my heart, and my portion for ever. 1. God was all-complete, all-blessed in Himself; but it was His will to create a world for His glory. He is Almighty, and might have done all things Himself, but it has been His will to bring about His purposes by the beings He has created. We are all created to His glory—we are created to do His will. I am created to do something or to be something for which no one else is created; I have a place in God’s counsels, in God’s world, which no one else has; whether I be rich or poor, despised or esteemed by man, God knows me and calls me by my name. 2. God has created me to do Him some definite service; He has committed some work to me which He has not committed to another. I have my mission — I never may know it in this life, but I shall be told it in the next. Somehow I am necessary for His purposes, as necessary in my place as an Archangel in his — if, indeed, I fail, He can raise another, as He could make the stones children of Abraham. Yet I have a part in this great work; I am a link in a chain, a bond of connexion between persons. He has not created me for naught. I shall do good, I shall do His work; I shall be an angel of peace, a preacher of truth in my own place, while not intending it, if I do but keep His commandments and serve Him in my calling. 3. Therefore I will trust Him. Whatever, wherever I am, I can never be thrown away. If I am in sickness, my sickness may serve Him; in perplexity, my perplexity may serve Him; if I am in sorrow, my sorrow may serve Him. My sickness, or perplexity, or sorrow may be necessary causes of some great end, which is quite beyond us. He does nothing in vain; He may prolong my life, He may shorten it; He knows what He is about. He may take away my friends, He may throw me among strangers, He may make me feel desolate, make my spirits sink, hide the future from me — still He knows what He is about. O Adonai, O Ruler of Israel, Thou that guidest Joseph like a flock, O Emmanuel, O Sapientia, I give myself to Thee. I trust Thee wholly. Thou art wiser than I — more loving to me than I myself. Deign to fulfil Thy high purposes in me whatever they be — work in and through me. I am born to serve Thee, to be Thine, to be Thy instrument. Let me be Thy blind instrument. I ask not to see — I ask not to know — I ask simply to be used. 1. What mind of man can imagine the love which the Eternal Father bears towards the Only Begotten Son? It has been from everlasting, — and it is infinite; so great is it that divines call the Holy Ghost by the name of that love, as if to express its infinitude and perfection. Yet reflect, O my soul, and bow down before the awful mystery, that, as the Father loves the Son, so doth the Son love thee, if thou art one of His elect; for He says expressly, “As the Father hath loved Me, I also have loved you. Abide in My love.” What mystery in the whole circle of revealed truths is greater than this? 2. The love which the Son bears to thee, a creature, is like that which the Father bears to the uncreated Son. O wonderful mystery! This, then, is the history of what else is so strange: that He should have taken my flesh and died for me. The former mystery anticipates the latter; that latter does but fulfil the former. Did He not love me so inexpressibly, He would not have suffered for me. I understand now why He died for me, because He loved me as a father loves his son — not as a human father merely, but as the Eternal Father the Eternal Son. I see now the meaning of that else inexplicable humiliation: He preferred to regain me rather than to create new worlds. 3. How constant is He in His affection! He has loved us from the time of Adam. He has said from the beginning, “I will never leave thee nor forsake thee.” He did not forsake us in our sin. He did not forsake me. He found me out and regained me. He made a point of it — He resolved to restore me, in spite of myself, to that blessedness which I was so obstinately set against. And now what does He ask of me, but that, as He has loved me with an everlasting love, so I should love Him in such poor measures as I can show. O mystery of mysteries, that the ineffable love of Father to Son should be the love of the Son to us! Why was it, O Lord? What good thing didst Thou see in me a sinner? Why wast Thou set on me? “What is man, that Thou art mindful of him, and the son of man that Thou visitest him?” This poor flesh of mine, this weak sinful soul, which has no life except in Thy grace, Thou didst set Thy love upon it. Complete Thy work, O Lord, and as Thou hast loved me from the beginning, so make me to love Thee unto the end.